Dieter studied Physics at UCT obtaining a BSc in 1987 and BSc(Hons) in 1988. 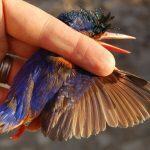 Dieter started bird ringing / bird banding while studying at UCT. Dieter obtained an MSc in Physics (radioactive dating of Kuiseb calcretes in Namibia). 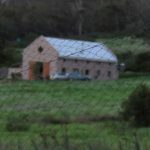 He served on the committee of the Northern Transvaal Ornithological Society (now Pretoria Bird Club) during 1996 and 1997. 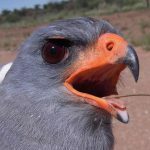 In 1998 Dieter took up the post of Bird Ringing Coordinator at SAFRING to coordinate bird ringing / bird banding in South Africa, a post he held for 20 years. He also worked to establish AFRING, a project to curate bird ringing / bird banding data from the rest of Africa. 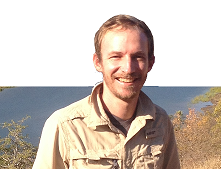 He completed a PhD in 2005 on the primary moult patterns of southern African weavers using the SAFRING database and his own bird ringing / bird banding records. Sally was inspired to study the natural world from high school. 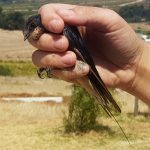 During an undergraduate in wildlife science (University of Natal), she discovered bird ringing / bird banding and birding. She completed her masters in African Mammals (University of Pretoria). She completed a PhD and postdoc in ornithology (Animal Demography Unit, University of Cape Town), looking at how large terrestrial birds (cranes, bustards, korhaans, secretarybirds) are responding to environmental change. 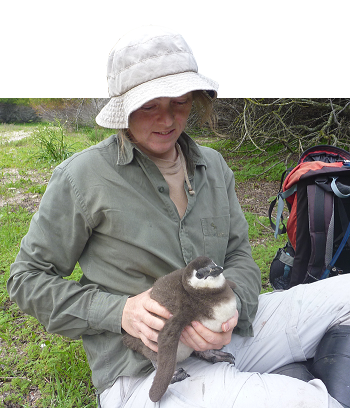 She also got her bird ringing / bird banding licence and established a regular bird ringing / bird banding site in Cape Town, and became involved in penguin monitoring on Robben Island. She currently works as an academic editor, but devotes as much time to ornithological fieldwork as she can. 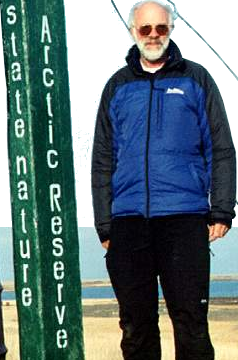 Les has been Director of the Animal Demography Unit (ADU) at the University of Cape Town since it started in 1991. 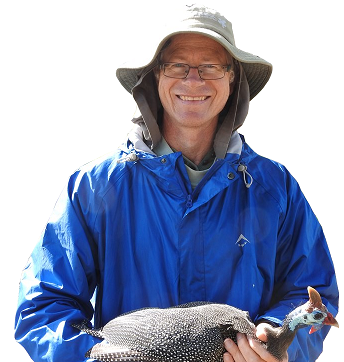 Although citizen science is Les’s passion, his background is in mathematical statistics. He was awarded his PhD in 1973 at UCT. He retrained himself as an applied statistician. Gradually the application of his statistics narrowed down to data analysis problems in biodiversity and took him into statistical ecology. 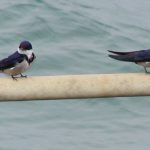 The initial research focus of the ADU was on birds, starting with the first bird atlas project; it rapidly broadened to cover mammals, butterflies, frogs, fish, reptiles and dragonflies. Les has supervised or co-supervised 22 MScs and 30 PhDs, and mentored 17 post-doctoral fellows. He has the Herschell Medal of the Royal Society of South Africa (1999), and BirdLife South Africa’s Gill Memorial Medal for a lifetime of outstanding service to ornithology (2017). Pete is a director of the BDI and a quantitative ecologist. He has a background in spatial and animal movement ecology, human-wildlife conflict, disease ecology, and behavioural endocrinology. Pete earned his BSc in Forestry (Nature Conservation) from Stellenbosch University, and his MSc and PhD in Fisheries and Wildlife Science from Virginia Tech. Pete has conducted research on numerous taxa, including cheetah, banded mongooses, Nile crocodiles, horses, bushbabies, bat-eared foxes, sheep, and various shorebirds. Pete has done field research throughout South Africa, Botswana, Tanzania, and the United States. Megan is passionate about biodiversity conservation and believes in the power of citizen science. She obtained her BSc in Environmental & Conservation Sciences through the University of Alberta, Canada. 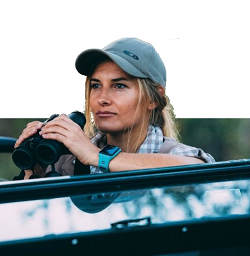 In 2011 she went on to complete her MSc in Zoology at the University of Cape Town, and most recently her PhD, looking at the impacts of bush encroachment on bird distributions in the savanna biome of South Africa.